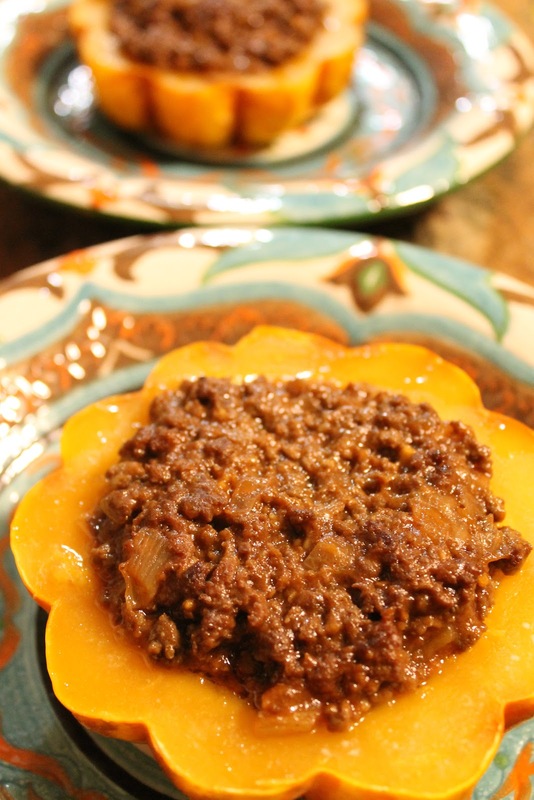 Bossy Italian Wife : Stuffed Squash For Two Recipe! Before my mother-in-law taught me this recipe years ago, I am not sure I knew that acorn squash existed--or that it was edible. Since then, though, I have made this recipe a million-billion times because it's just that good. 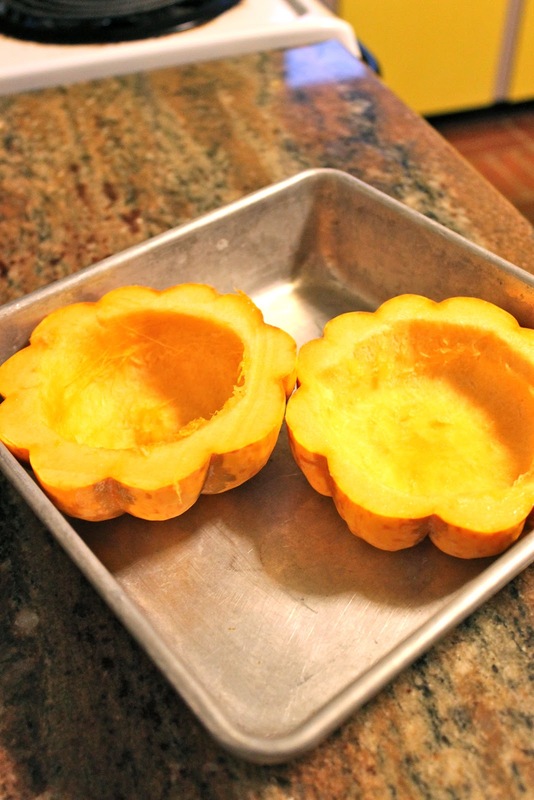 So if you are/were like, "What in the heck--you can eat that squash?" Yes, it's true. This recipe is easily made for two, or for many more, depending on who you are feeding. 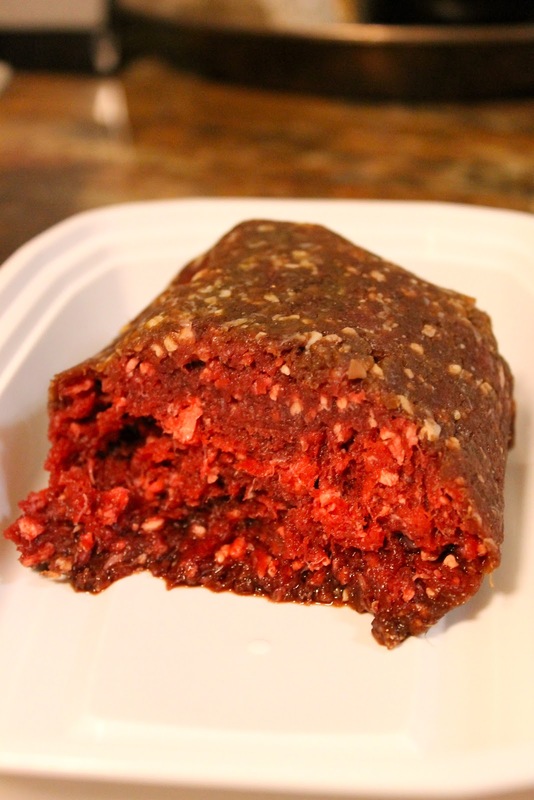 It's also pretty versatile, accommodating nearly any type of meat you wanna throw in it. And, for those of you among us who don't fancy meat, you could even modify this recipe and stuff these suckers with quinoa instead. Now, before we get any deeper into this squash recipe, I have a confession to make. For some of you, this may come as a shock...but nonetheless, I feel obligated to tell you. To begin you will need to half an acorn squash and scoop the seeds out. Place them in a pan and set aside, but only after you have taken a moment to appreciate how floral and lovely they look. Here I have about a half pound of venison. Doesn't it look pretty? I know I am not alone in my love of meat. In a skillet, put two tablespoons of olive oil and let it heat over medium high heat. Add your meat and break it up into crumbles. Once the meat is getting nice and browned (about 5 minutes or so), add half a diced onion, and some garlic, too. Let that cook until the onions are translucent, about 3-4 minutes more. Worcestershire sauce is undoubtedly one of my favorite things in the world. Two tablespoons of it are going in. And honestly, I wish you could smell this picture because at this moment, I was just standing here taking in the lovely smell of meat and worcestershire sauce. Heavenly. If you are feeling especially frisky, throw in a dash of cayenne. YAY! Ketchup time. Say a prayer to the processed food gods and banish the evil thoughts from your mind. Or, if you prefer, use tomato paste and water in place of the ketchup--no one but you loses out--and we aren't fooled by your denial of liking ketchup! I'm not even going to put a measurement on this because how much ketchup you use will be entirely up to you. It's likely to be somewhere between 1/4 and 1/2 cup. Mine was somewhere in the middle. Now you'll want to be making use of those squash--by filling them with your lovely meat and ketchup concoction. If you have leftover filling, just eat it because it's yummy and you know you are dying for a bite. Or save it and make a sandwich out of it. Now, take some water and pour it into your pan. I go about an inch--you don't need to overdo it, just a little will be fine. Cover the whole thing with foil. Pop it in a 375 degree oven for 45 minutes.... and when it's done, it'll come out all good and steamed and delicious! I like to test mine with a fork. If the fork goes into the squash easily, it's done! HELLLOOOO there....I hear you have a little ketchup in you. Mind if I take a look? Hehe. More food flirting. What can I say? Ketchup makes me feel positively naughty! To remove the skin, using a knife to go around the edges. It should come off very easily! Half your acorn with a sharp knife, and scoop out and discard the seeds, leaving a nice space for filling. Put the two halves in a baking dish and set aside. In a skillet, heat the olive oil over medium high heat. 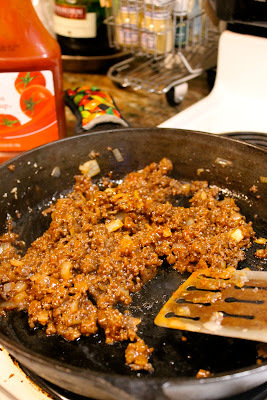 Once the pan is hot, add the meat and using a spatula, break it up so that it "crumbles" into smaller pieces. Allow the meat to cook and brown, stirring frequently, about 5 minutes. Once the meat is nearly browned, add your onion and garlic. Continue to cook and stir for another 3-4 minutes or until the onions become translucent. Add your dash of cayenne pepper (optional) as well as the worcestershire sauce. Stir. Add ketchup (as much as you like) and stir, creating a sauce. Salt and pepper to taste. Remove the skillet from the heat. Spoon the filling into the prepared squash, dividing evenly. Fill the pan containing the squash with some water-about 1 inch or so. Cover the pan with tinfoil and bake in the preheated oven about 45 minutes or until squash is tender. I usually serve it with a salad, or pickled beets!